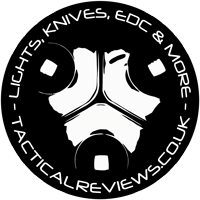 Discussion in 'Knife Reviews & Testing' started by Subwoofer_CPF, Feb 27, 2018. 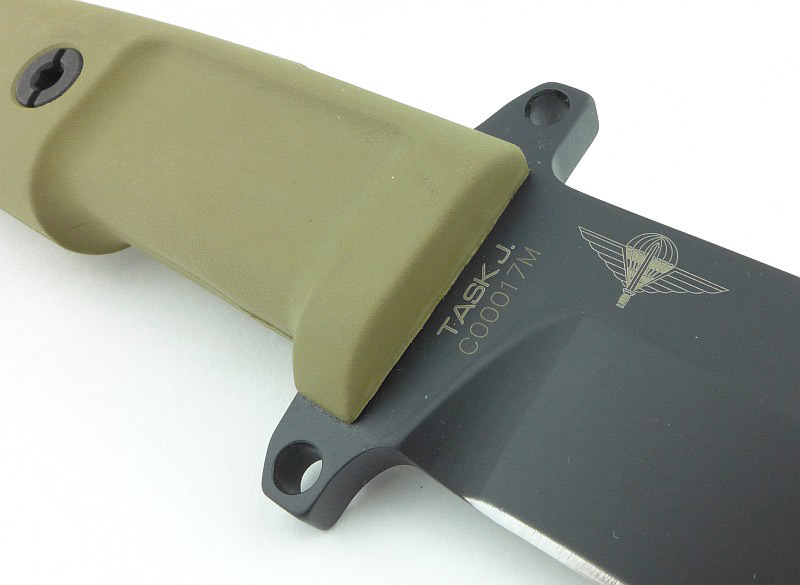 Based on the original TASK tactical knife designed by Thilo Schiller, this version of the TASK, the TASK J has been developed as a collaboration with the Jagdkommando Unit, the Austrian Army special forces. Their requirements were for a heavier duty version of the original TASK which could survive more extreme use. 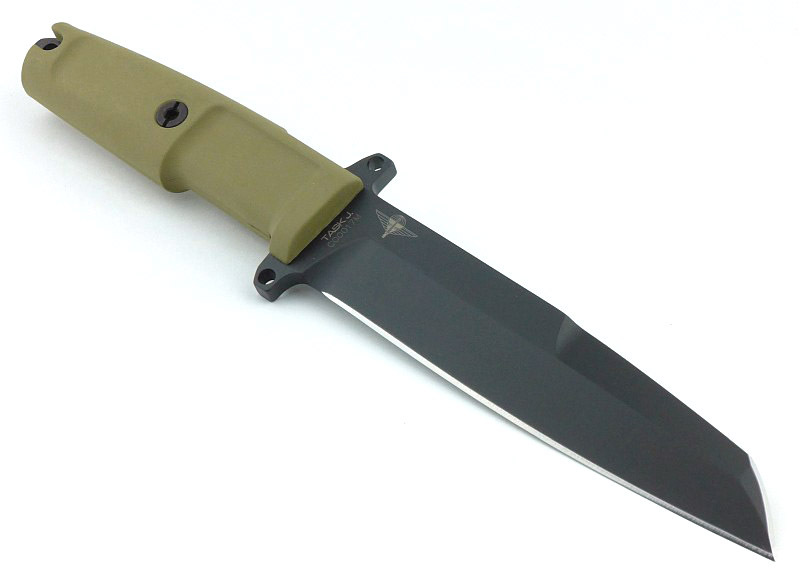 The TASK J's factory edge has an average BESS 'C' sharpness of 533. Though this officially comes in as a 'dull' edge, it will just slice 80gsm paper. 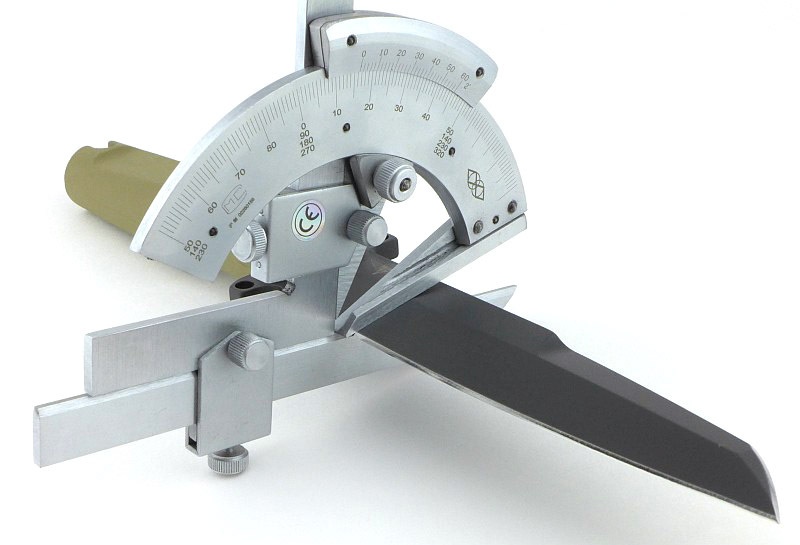 Because there are some areas at a BESS 'C' score of 407, that allows for a borderline working edge, which is the only reason it is possible to slice 80gsm paper with this factory edge. Direct quote from Extrema Ratio's website. 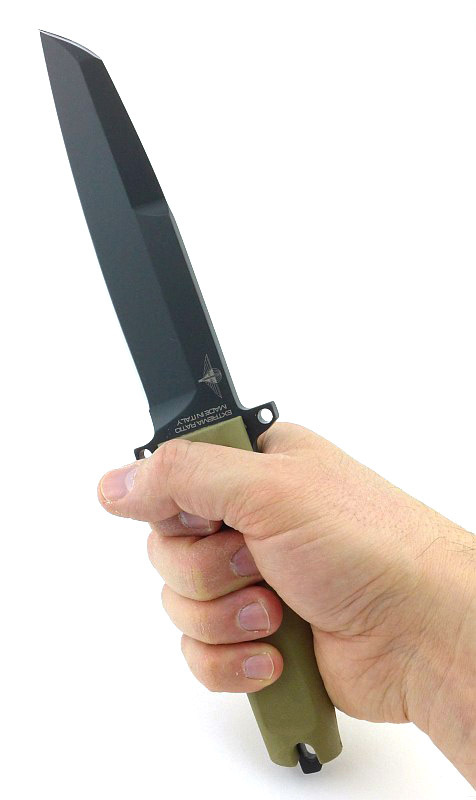 "This tactical knife has been developed together with material experts of Jagdkommando Unit, the Austrian Army special force. 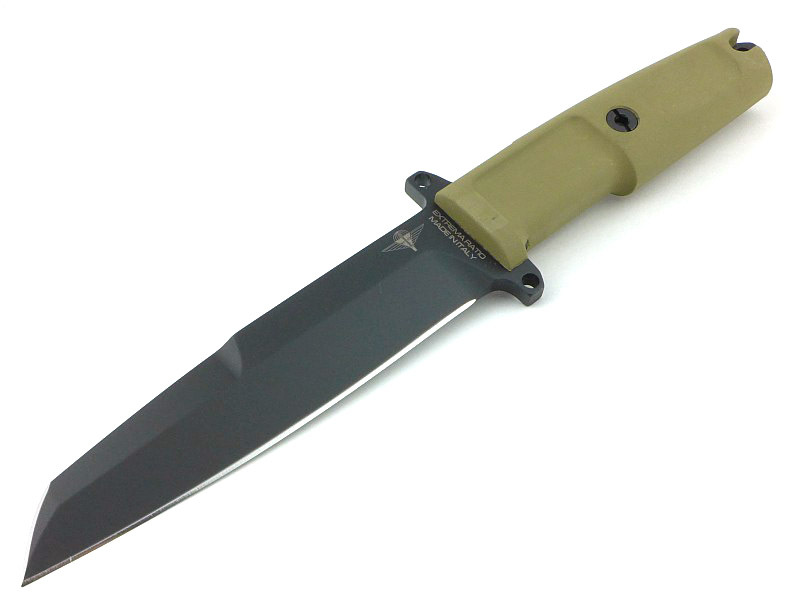 It is a multi purpose tactical knife with double guards to avoid accidentally slipping of the hand on the blade. 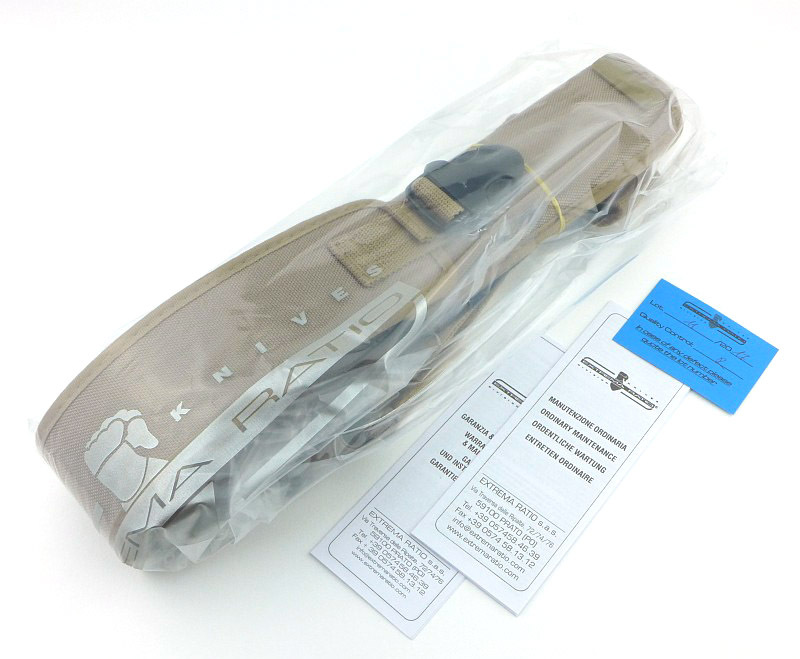 It comes with standard desert side sheath with automatic retention mechanism and protective slap. A fireball flint and striker is placed inside the sheath." A well made cardboard box is used for the TASK J. 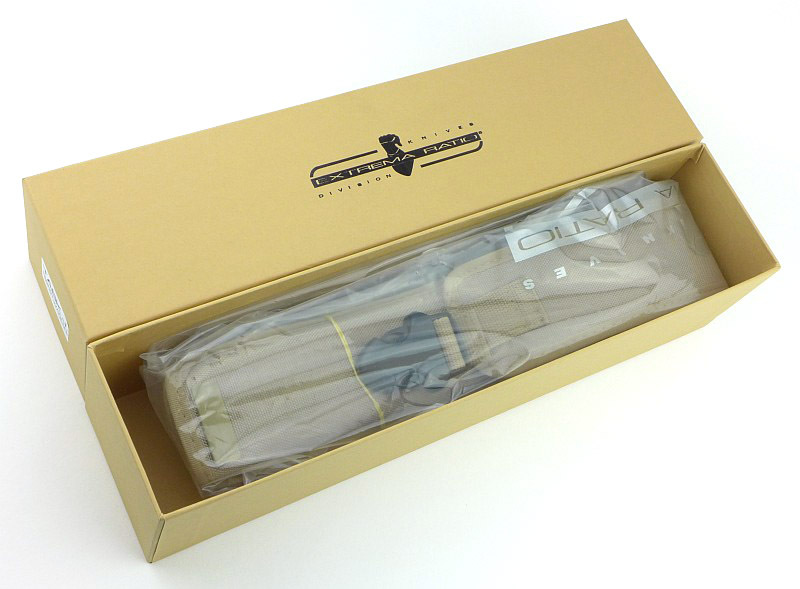 The full package is wrapped in a plastic bag, and fills the substantial box. Along with the bagged knife are two leaflets and a quality control card. Slipping the TASK J out of the bag; the leg strap is kept neatly in place with a rubber band. Taking a moment here to mention that Extrema Ratio have packed the design of the sheath with so much detail, this needs to be appreciated, so we'll be covering this before moving onto the knife. 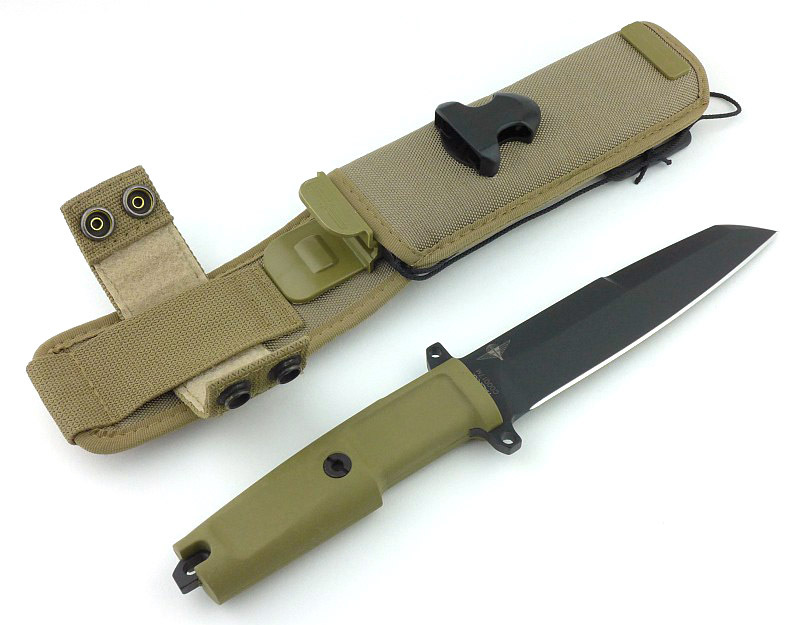 Being a full size knife, there is a removable leg strap to allow you to really keep it under control in vigorous situations. 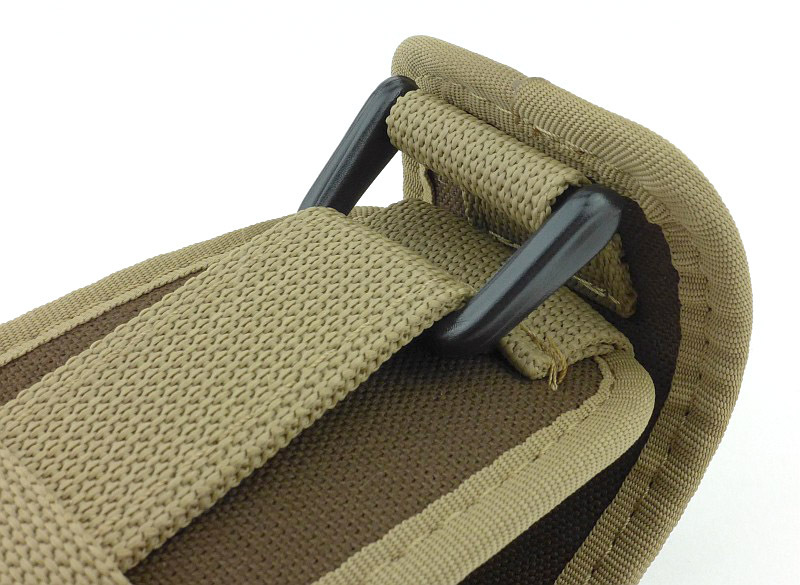 The leg strap has a double elasticated section so you can fit is snugly without then finding it cuts in uncomfortably. 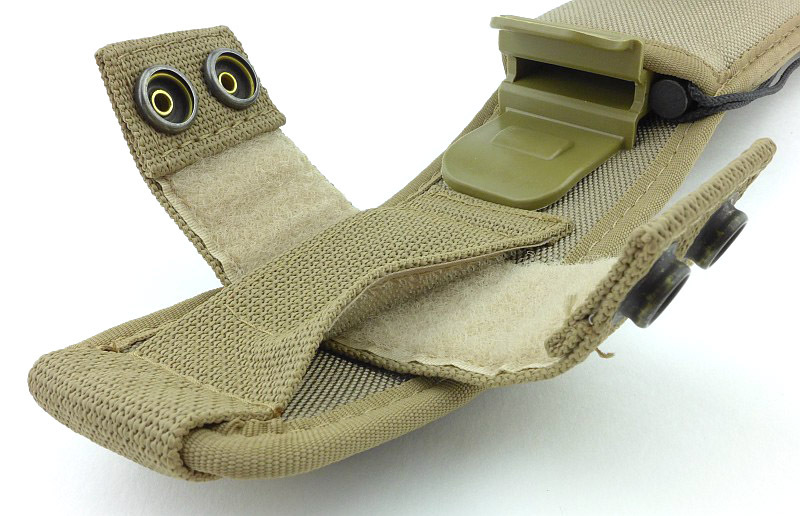 Both ends of the leg strap are adjustable in length using velcro. 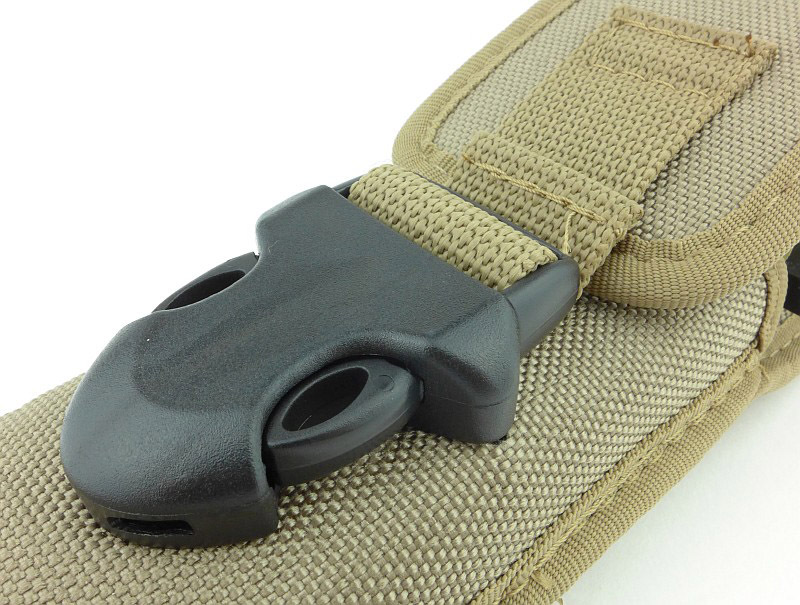 There is an elastic cover to slide over the end of the strap end to prevent it from being pulled away during use. Onto the main sheath. 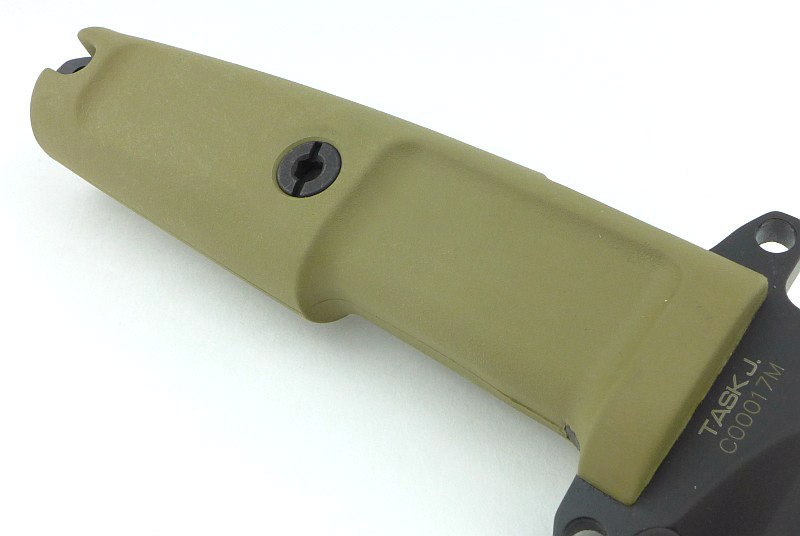 The most obvious atypical feature is the full knife handle cover; as shown here, the knife itself is almost fully concealed. This flap is a critical feature to help prevent a knife fitted to a pack becoming a 'hang up' hazard. With the flap over the knife handle it is far less likely to catch on something. 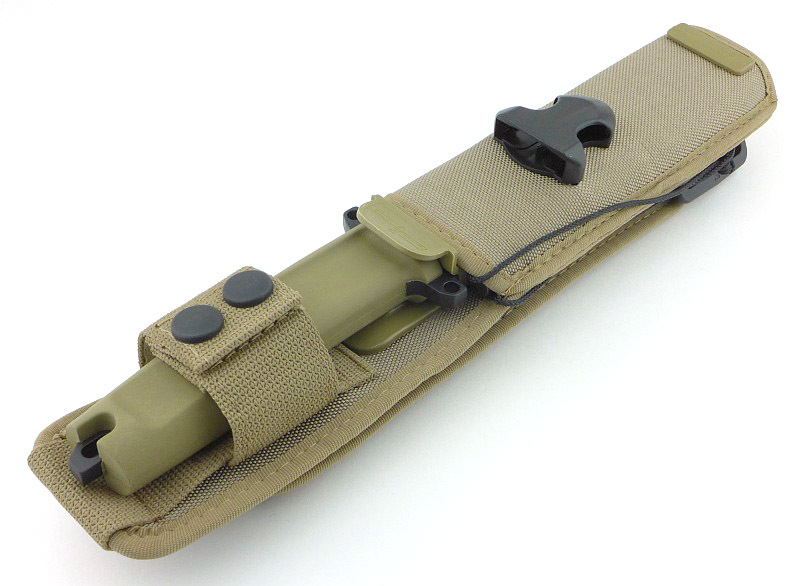 Not relying on a fabric to keep the blade from cutting through the sheath, there is a full plastic sheath liner. This is the bottom of the sheath with the special fixing (visible on the front of the sheath) and the black plastic liner plug that closes off the end of the liner, but leaves gaps for drainage. 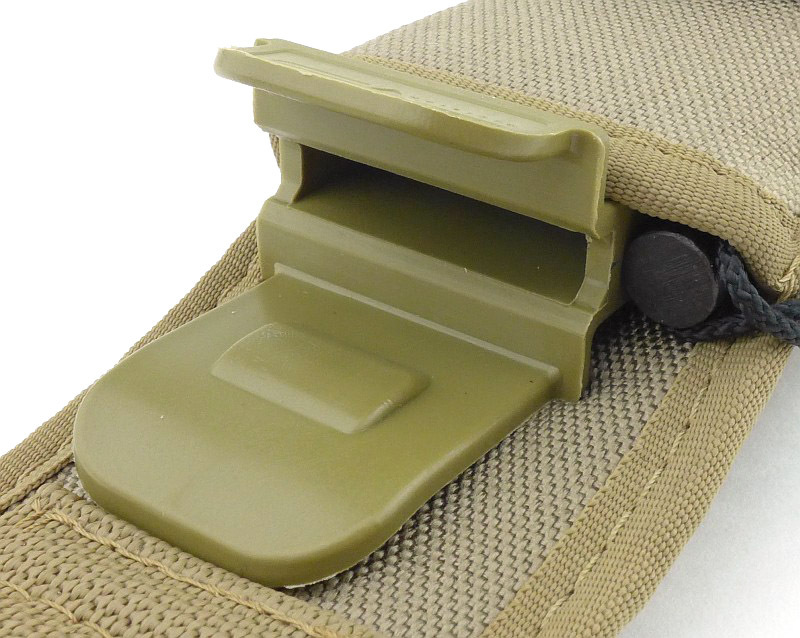 A high quality plastic snap buckle holds the knife cover flap in place. 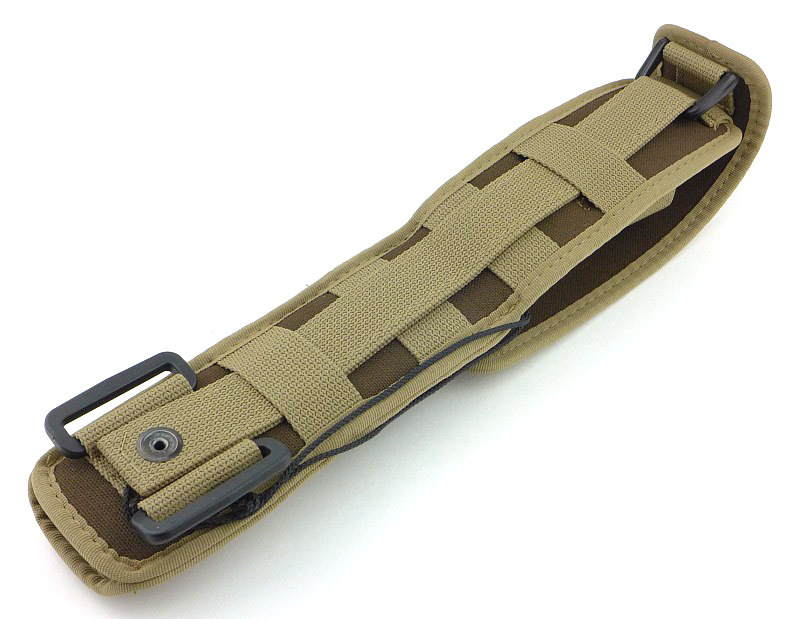 Rolling the sheath over and there is a full length MOLLE fixing strap. 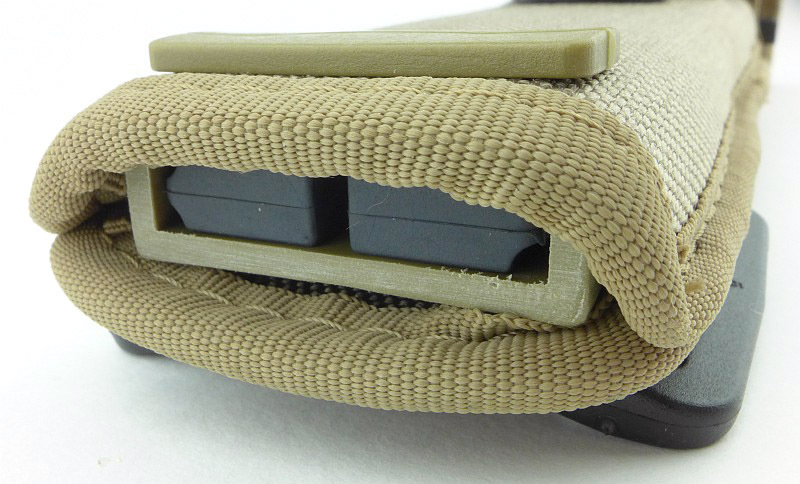 The top of that MOLLE strap is what holds the removable knife cover flap in place. Here the knife cover flap has been folded under the rest of the sheath. Note the thin black cord running down the side of the sheath. 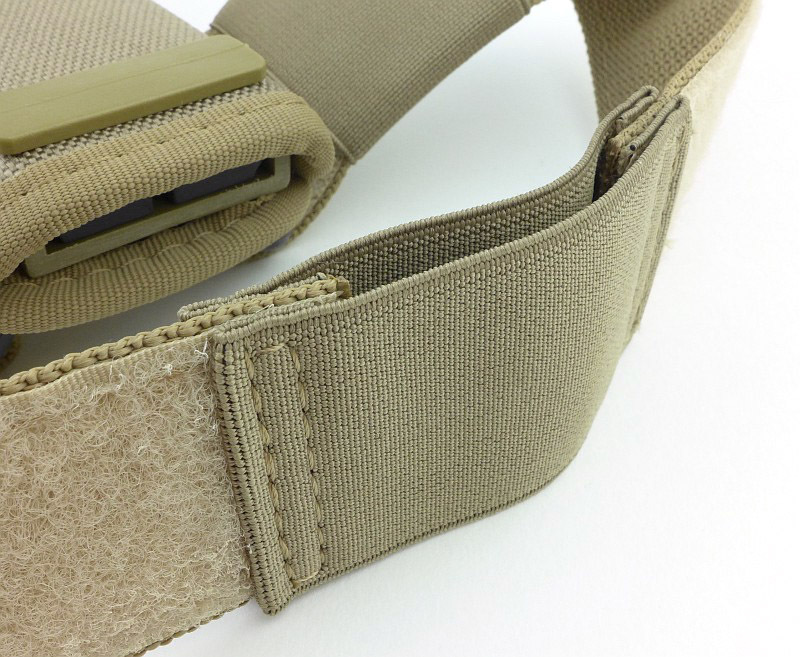 That cord runs all the way down and is held by the MOLLE strap press stud. 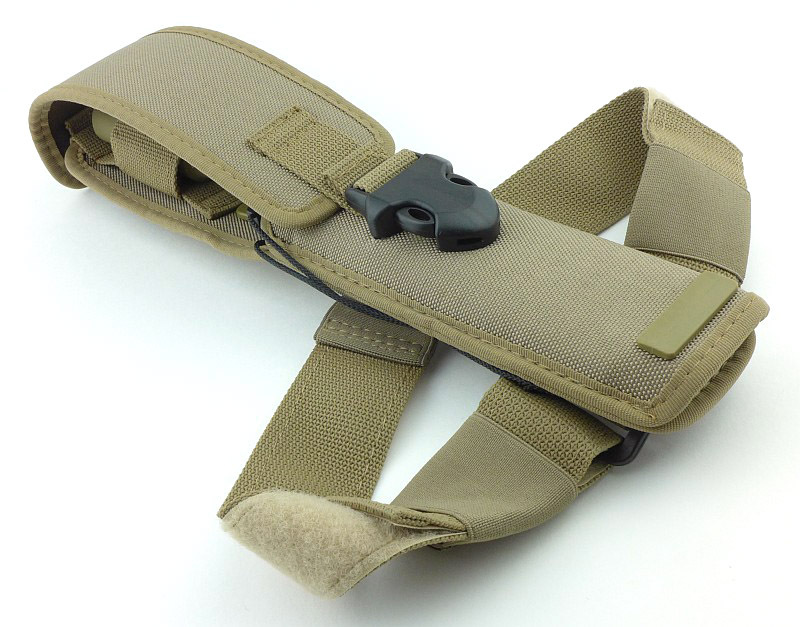 The knife retention strap is also adjustable / removable, with velcro holding it in place. 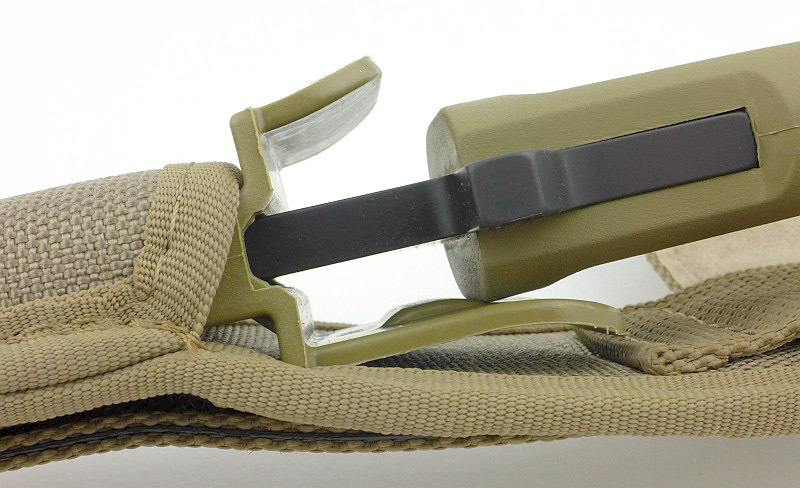 The primary knife retention is not the strap, but is a plastic tab that is part of the sheath liner. You can see how the side of the handle hits that plastic tab as you insert the knife into the sheath. Push a little more firmly, and the knife clicks into place. It is now held in the sheath by this plastic tab, requiring a firm pull to free it. Having covered its feature packed sheath system, here is the TASK J. Though similar to the TASK in that it has a double-edged, modified wharncliffe blade, the primary bevel is quite different, as well as the blade having a bayonet grind. The blade is symmetrically ground. 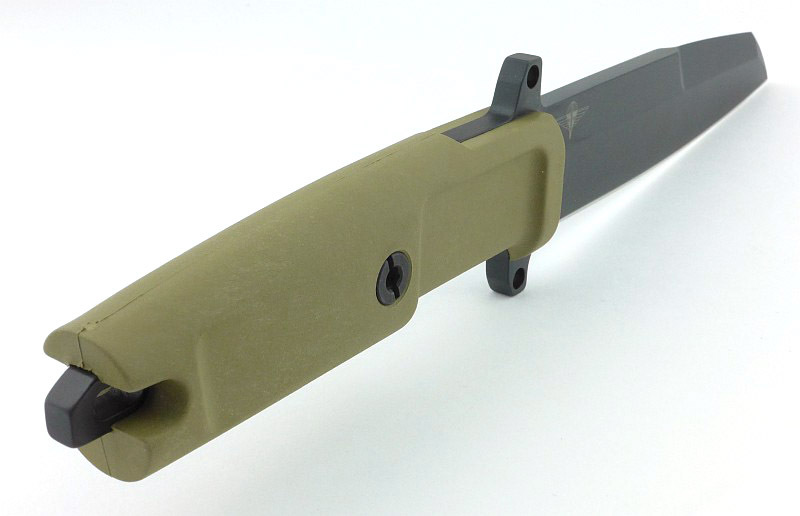 Extrema Ratio's distinctive Forprene handle is used, in this case the desert colour. Used on several models, this recognisable handle is particularly effective. The grip design provides a secure dual finger groove and the Forprene material cushions the user from the shock of heavy blows. Another clear design feature intended for extreme use, is the double guard which provides the greatest protection against the hand slipping forward onto the blade. A well radiused plunge line keeps maximum strength at the transition from cutting edge to ricasso. Note the lack of a choil which in this case removes the chance of a hang-up if the blade has made a full depth cut. There is a single bolt to keep the handle in place. To properly show the proportions of the TASK J, this side shot minimises perspective distortions. 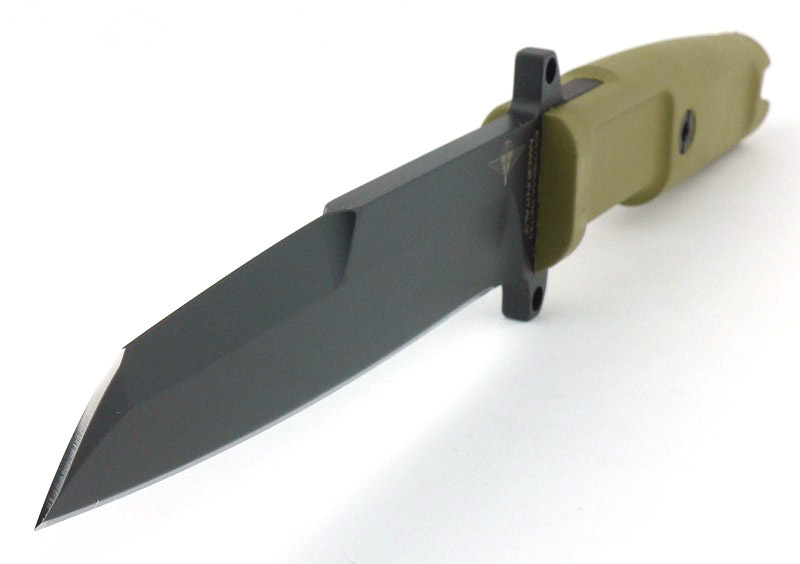 Extrema Ratio's TASK J is not what I would normally think of as your 'every day' knife. 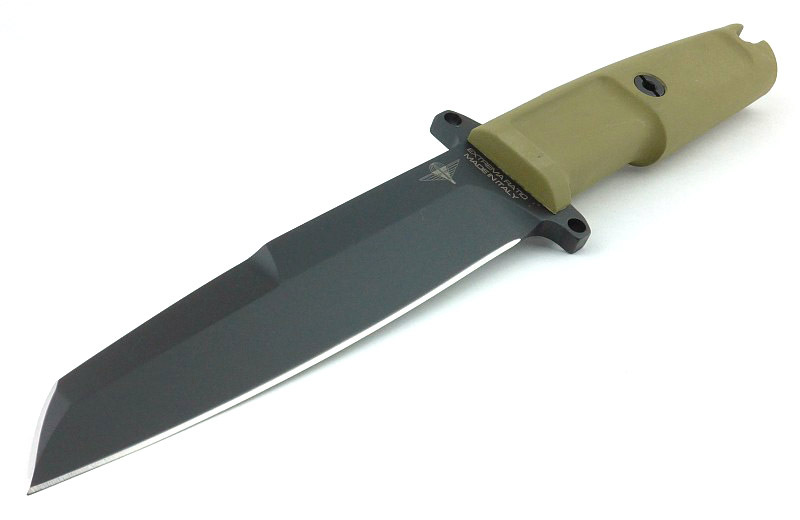 It is a specifically heavy duty knife, for conditions where you need that absolute assurance the blade is as strong as it could be and will take anything you throw at it. 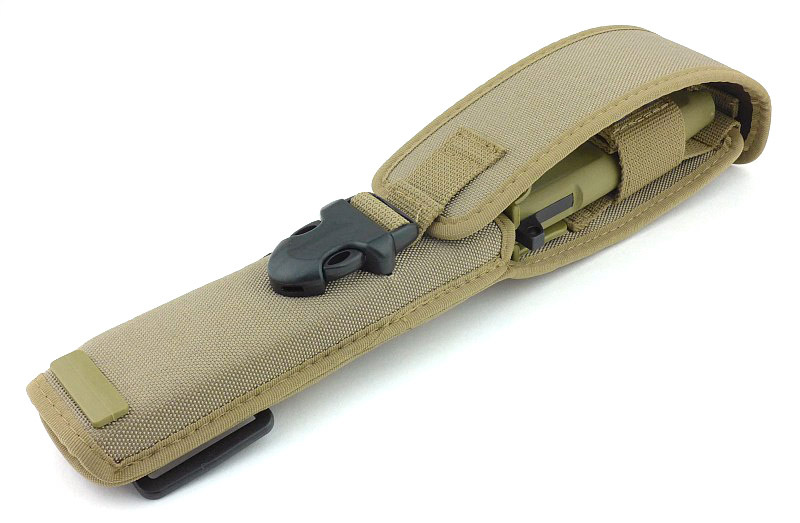 The superb attention to detail in the sheath design only reinforces how the whole package is intended to work in conditions most of us will thankfully never have to endure. With comprehensive carry options you can pack this knife in all sorts of ways and know it will still be there with you through the worst. What the TASK J does that is different to most of the other knives capable of demolition/extraction work, is to maintain the more refined feel of a general purpose knife instead of just seeming like a large slab of steel - an important distinction. Taking the TASK J in hand, and it is a full size knife, having a blade just over 6" long. The ultra modern looking grip is very comfortable and secure to hold (one reason it features on many of Extrema Ratio's knives). Despite the amount of meat in the blade it does not feel overly heavy or unbalanced. In a reverse grip, the top guard does interfere somewhat with the range of movement, and makes it more difficult to bring the blade back close to your arm. Going back for a minute to the sheath, the click-retention makes for a very effective system, the knife can come in and out of the sheath repeatedly, yet despite not using the retention strap, it is held securely and won't fall out. Details like this are not to be underestimated, as working with a knife it is far better to re-sheath it than leave it lying about between cuts, and if you have to move off in a hurry, it stays where it should be and with you. There is nothing flimsy about any aspect of the sheath. Wherever you put it is where it will stay, and it is also fully ambidextrous. 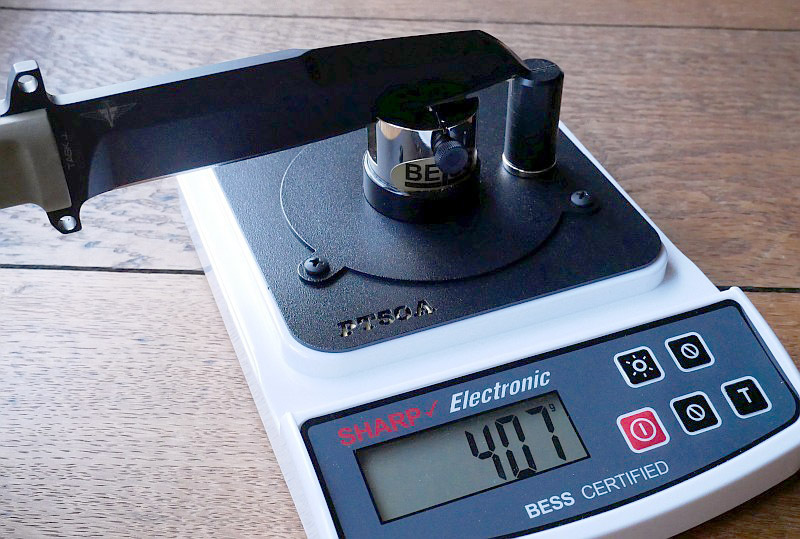 For such a heavy duty blade, the balance is extremely good. It is in front of the first finger, as the balance point sits at the guard itself. This makes it slightly blade heavy, but much less than similar knives, and certainly not fatiguing when using it for finer duties when you want a lighter feel. With there being such a large fire-steel included I was surprised that there wasn't a striker on the blade spine. Extrema Ratio said that with the fire-steel only likely to be used in very rare instances, if needed, the blade edge would be used. Definitely not something I'd want to do, so I'll be grinding a small striker into the spine. 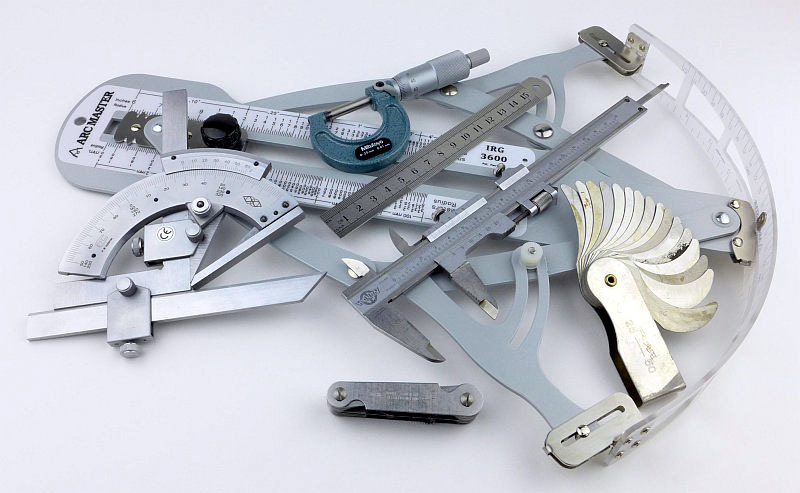 Putting the TASK J next to the Extrema Ratio knife that first drew me to the brand, the Fulcrum. 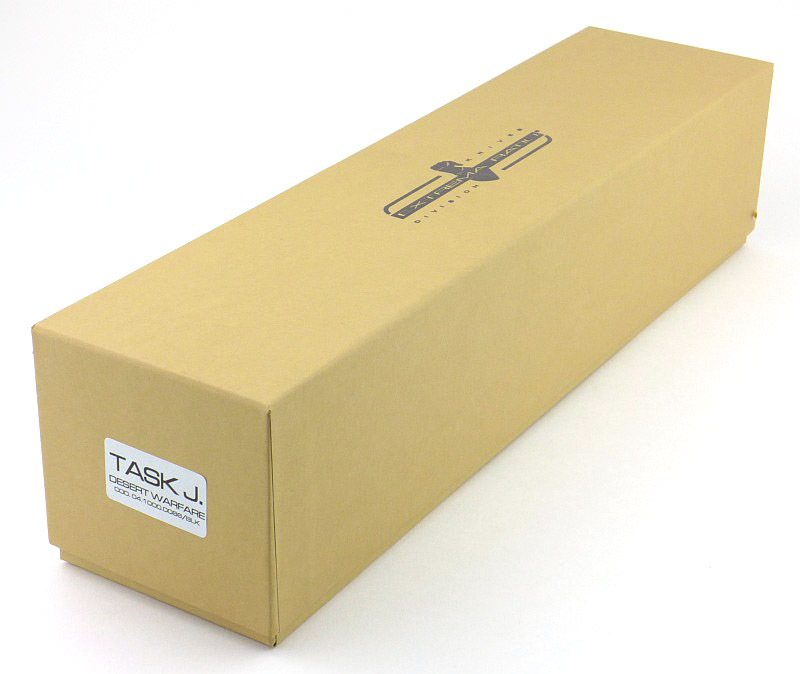 The TASK J's blade is a little wider and shorter than the Fulcrum. With the Fulcrum's double guard next to the TASK J's, also note how the TASK J has lanyard / lashing holes in its guard - more flexibility in the way you can use it. 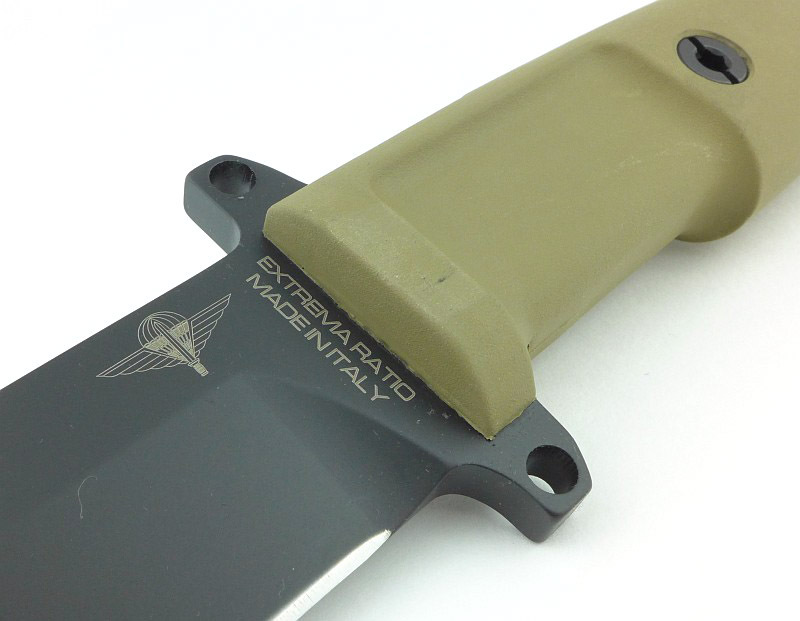 It might have been made for the special forces, but this is firmly in the territory of a tough survival /utility knife. 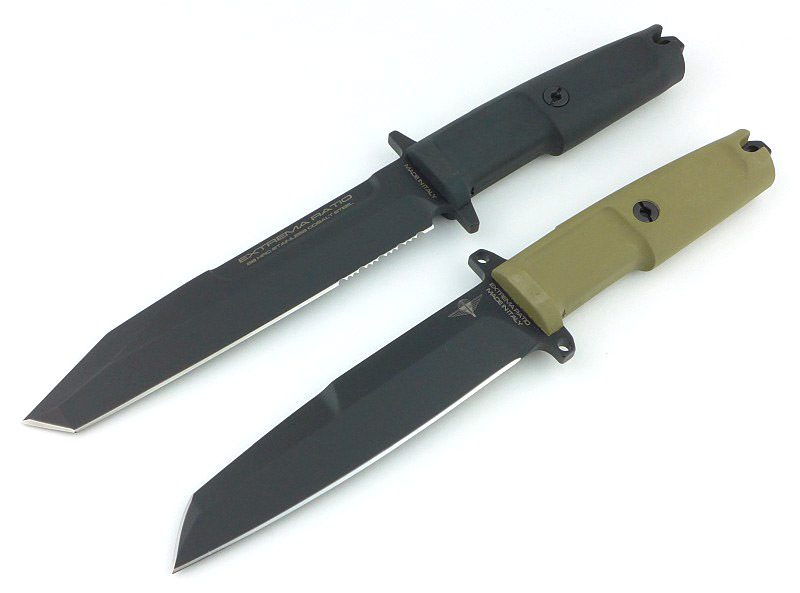 With the TASK being such a good general utility blade, it is no surprise that a special forces unit (the Jagdkommando Unit) were enthusiastic for a heavier version of that blade style, and they certainly got it in the TASK J. Strong, but well balanced, blade. Super versatile and effective sheath. Double guard with lashing points. Blade coating can 'drag' when cutting. No striker for the fire-steel. Great read, other than out of the box sharpness there is alot to like about that knife. It is a very utilitarian almost SEAX design to the blade that I find very appealing. 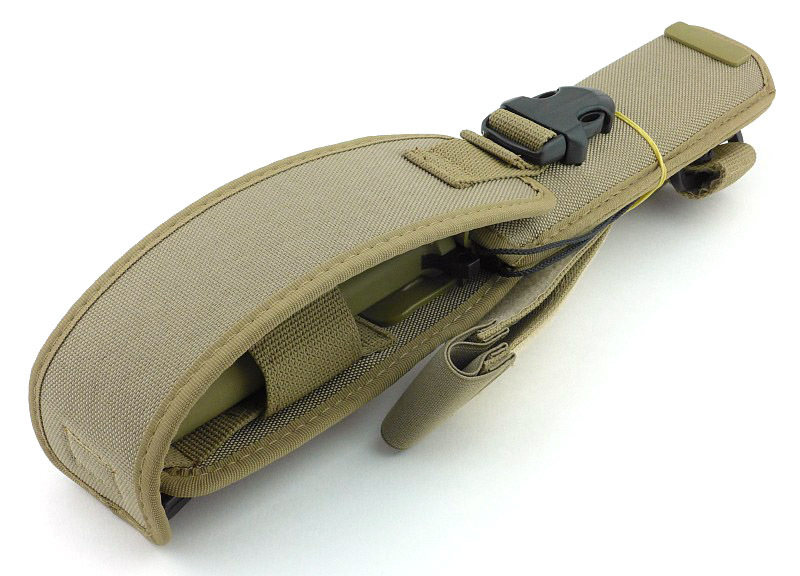 Great looking sheath too with lots of strap options. Good review. That style of knife does not fit my uses well but sure is a beautiful blade. I always wanted an Extrema Ratio. However even the folders (most of them) have truly thick blades for my taste. And are heavy! The most interesting thing about this knife for me was the cutting edge geometry, ie it curves slightly outwards and is not straight. On penetrating moves this will deepen a cut just by pushing before any downward force is applied. Military uses here obvious without further explantions. Also in terms of sharpening/maintaining the edge it requires some skill to sharpen (which I found easiest using carbide wet and dry paper) over soft leather or medium density foam rubber sheet. A rod would work equally well in the field but the convex edge would have to go. Something I don't understand is that while the blade might or might not me your cup of tea... The handles... I cannot understand them! !